Smart thermostats that earn the ENERGY STAR label have been independently certified to deliver energy savings. For the average American household, almost half of the annual energy bill goes to heating and cooling – that’s more than $900 a year. Being smart about how you control your temperature settings with an ENERGY STAR certified smart thermostat will help you save money and stay comfortable in your home. Each product uses slightly different features to help homeowners save energy, so do your research, and choose the ENERGY STAR certified smart thermostat that's right for you. Using your smartphone, you can adjust the temperature in your home from anywhere with an internet connection. This feature allows your thermostat to detect when you’ve left for the day to ‘set back’ your HVAC system and save money on your heating or A/C bill. If you’re on the way home, the thermostat can automatically adjust the temperature to ensure you arrive to a comfortable home. Certain ENERGY STAR certified smart thermostats can learn your preferences automatically and establish a schedule that adjusts to energy-saving temperatures when you are asleep or away. Your thermostat may update its software periodically to ensure it uses the latest algorithms and energy-saving features available. Make sure the smart thermostat you purchase is compatible with your heating and cooling system. For the very highest efficiency heating and cooling equipment, you may want a controller from the same company. (E.g. Air conditioner rated at 20 SEER or higher). If your smart thermostat uses WIFI, make sure it’s reasonably close to the router to prevent periodic disconnections. If your thermostat is too far from your router, consider a WIFI range extender, which can improve overall connectivity. ENERGY STAR certified smart thermostats are also designed to be compatible with the programs that some local utilities offer, providing home owners in their service territory with incentives to help them manage reliability. 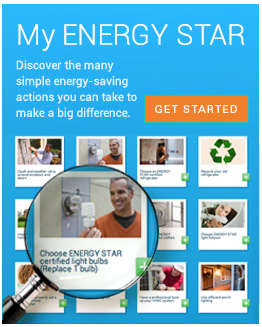 Pledge to choose an ENERGY STAR certified smart thermostat. If everyone used an ENERGY STAR certified smart thermostat, savings would grow to 56 trillion BTUs of energy and $740 million dollars per year, offsetting 13 billion pounds of annual greenhouse gas emissions. Thank you for pledging to make the smart choice!